Whatever the answers to these questions may be, we know from our own practical experience and research that the majority of children with Down syndrome achieve all the basic motor skills necessary for everyday living and personal independence. They may be later to achieve them, and their movements may seem a little clumsy or less refined as they carry out tasks, but they still have adequate skills for daily competence. They may have more difficulty in becoming skilled in games and recreational activities but many individuals do reach high levels of achievement when given the opportunity. Research into the motor development and motor skills of children and adults with Down syndrome is limited and, as we have studied the available information, we have come to believe that some unhelpful myths keep being repeated as explanations, without supporting evidence. One of those myths is hypotonia or 'poor muscle tone'. Almost every article we have read has used hypotonia as an explanation, when in fact it probably plays little part in determining children's motor progress. We will return to this issue later. In this article, we consider four questions. What do we know about motor development in typically developing children and the factors that may influence rates of progress or levels of skills achieved for different motor activities? What do we know about the pattern of motor development usually seen in infants, children and teenagers with Down syndrome? What do we know about the effects of therapeutic interventions? Can we draw on these three sources of evidence to identify some principles for effective intervention and activity programs for individuals with Down syndrome across the age range? Before we can discuss motor skills, we need to recognise that the term covers a wide range of activities and actions and we have divided them into three somewhat arbitrary groups in order to more conveniently discuss therapies and interventions later. recreational or specialist skills which are optional and based on interests and aptitudes. Basic skills include sitting, walking, running, climbing stairs, picking up objects, using cups, knives and forks, pouring drinks, dressing and managing fastenings, holding and using pencils, pens, scissors and using keyboards. Recreational skills include skipping, throwing, catching, hitting and kicking balls, riding a tricycle or a bicycle, swimming, skiing and all sporting activities, playing a musical instrument and playing computer games. These divisions are somewhat arbitrary and do not imply the use of separate parts of the motor system, as elements of gross motor control such as maintenance of balance and body posture play a part in carrying out fine motor activities. However, they provide a useful practical way of dividing the whole range of possible motor skills and they link with the sources of therapy and teaching available to children and parents. Physiotherapists tend to be expert in the development of basic gross motor skills and occupational therapists tend to be experts in fine motor skills, although their skills will often overlap. Recreational skills tend to be taught by teachers, physical education experts, sports coaches and specialists such as music teachers. being able to move independently also increases opportunities for social interaction and language learning. For example, once a child can move, they can go to see what happens when the postman comes to the door or the telephone rings. They can follow their carers around so that they are talked to and included in everyday activities. 1. What do we know about the development of motor skills in typically developing children? In this section we consider first what we know about how all human movements are controlled and improved, and then what we know about the developmental progress of motor skills in children. We have provided some detail for the reader because a number of the explanations given for the motor delays of children with Down syndrome can only be discussed if the reader has some knowledge of the mechanisms involved in movement. The mechanisms of normal motor control are complex and not yet fully understood. Any movement requires the coordinated action of the brain, nerves, muscles and limbs and, as a movement is carried out, there is fast continuous control and adjustment occurring as the brain monitors the progress of the action. Feedback from the muscles and limbs, from vision and from balance systems is an integral part of all movement control as it is taking place. This is illustrated in Diagram 1. The brain and spinal cord constitute the central nervous system (CNS). All of the information processing necessary for producing the coordinated movement of skeletal muscle takes place in the CNS. The eyes obtain visual information about the environment and the body itself. This information is integrated with other types of information as part of the feedback system for muscular coordination. The semi-circular canals near the inner ear (vestibular apparatus) provide information about the position of the head relative to horizontal and vertical planes (indicating upright, leaning or falling body positions) and acceleration (changes in speed). They are therefore important in maintaining balance. 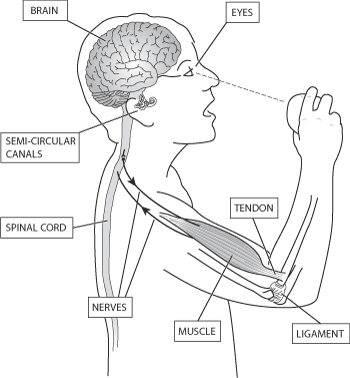 The nerves of the peripheral nervous system may be motor or sensory. Motor nerves carry information from the central nervous system, and control muscle contraction and relaxation. Sensory nerves carry feedback information from muscles, tendons and other tissues to the CNS. Muscle is a tissue which, using the glucose and oxygen provided by the circulating blood, converts chemical energy into mechanical energy by contracting. Muscle contraction produces the movements involved in all body activities. The two important types of muscle are skeletal muscle and smooth muscle. Skeletal muscle moves the limbs, trunk and other parts of the body which are involved in so-called voluntary movement. It is controlled by nerves from the CNS. Tendons are cable-like structures which connect muscles to the muscle attachments on bones. Ligaments are similar to tendons but generally attach bones to each other. It is known that all 'voluntary' movement is controlled by impulses from nerves that originate in the central nervous system, which consists of the brain and the spinal cord. With the exception of some basic safety reflexes (spinal reflexes), which may be mediated through the spinal cord, all coordinated movement sequences are determined by the brain. Although there are parts of the brain that are mainly concerned with the control of movement, such as the cerebellum and the motor and pre-motor areas of the cortex, it is important to note that motor control is widely distributed in the brain, with many other areas being involved. The skeletal muscles are those which move the limbs, trunk, neck and other parts of the body. They are sometimes called 'voluntary muscles' because they produce the movements involved in activities such as walking, handling objects and participating in sports. It is important to note that these movements, which involve a very large number of brain activities as well as very many accurate muscle movements, are not really under any form of conscious control at all. When we carry out these functions, we are mainly conscious of the results we wish to achieve rather than the detailed means by which we attain the outcome. For example, we think 'I will pick up my keys' - we do not think 'I need to move this muscle and then that one to direct my hand to the keys'. afferent nerves, which carry information to the brain. The efferent nerves activate systems which cause the muscle to contract with varying degrees of strength and speed, depending upon the type of message and the type of muscle fibers receiving the impulses. The impulses in the afferent nerves contain feedback information about the movement and position of the muscles and limbs, which the brain uses to ensure that the required movements are correctly carried out. and information about the position of the body in relation to the horizontal and vertical, as well as acceleration, from the semi-circular canals near the inner ear (vestibular system). All this information (feedback) is continuously processed in the brain and it enables the brain to send appropriate instructions to the muscles to produce the highly coordinated movement patterns required for normal function. Tendons are cable-like structures which connect muscles to the muscle attachments on bones. Ligaments are similar to tendons but attach bones to each other. It is generally agreed that the ligaments in people with Down syndrome are more elastic than in typically developing people. The effect of having ligaments which are more stretchy than usual is that the joints are capable of a much greater range of movements than is typical. It is likely that this effect has been confused with that of muscle tone. When children or adults begin to learn any new neuromuscular skill, such as walking, drawing or swimming, they initially carry out the task in a clumsy, not very well coordinated fashion. But, with sufficient practice, they will eventually perform the task in a smoother and more efficient manner. The effects of practice on the brain have been demonstrated with suitable brain imaging techniques. During this learning period there may be some changes in the muscles involved, such as some increase in strength, but virtually all of the changes related to the development of the new skill take place in the brain. There is no evidence that factors such as bone length, stretchy ligaments or altered muscle tone have any significant effect on neuromuscular actions. Presumably this is because brain control systems compensate for these factors during the learning process. Since muscles 'do what they are told', and since the instructions to the muscles all come from the brain, differences in the quality of movement such as slower or less well coordinated movement, can be seen to have their origin in the brain and where improvements in movement occur they are associated with changes in brain mechanisms. It is thought that practice leads to learning and to the development of 'motor programs' or plans for particular movement sequences in the brain. These motor programs enable movement sequences to be performed more quickly and accurately over time. As practice of the movement continues, the motor programs become so well learned that they are referred to as being automatised. It has been suggested that once motor programs are automatised, they make less demand on the information processing capacities of the brain. The reader is reminded that the control of the majority of basic movements is carried out at a subconscious level. The effects of automatisation can be made clearer by considering a task in which a series of complex movements are learned, such as when learning to drive a car. In this situation the learner has to consciously control the series of movements initially - i.e. to think what to do next. However, over time, the series of actions may become so well practiced and automatised that virtually no conscious control is needed to change gear or to steer the car. Now the driver can give full attention to road conditions and safety, as the information processing demands of controlling the car have been considerably reduced. In all movements, there is a significant information processing requirement as the brain continuously processes feedback and sends control messages to the muscles in order to carry out the activity successfully, but it is at a subconscious level. The individual simply gets up and walks or picks up a cup without any conscious consideration of the controls on the movements needed for the particular situation - any conscious mental activity is simply focused on the goal of the activity. In addition, some motor tasks require conscious information processing and decision making before carrying out the movement. The reaction time task used in research is one example, as a conscious level of decision making is involved before initiating the movement. The reaction time is the time taken between the signal to start a movement and the movement itself. Here a person may be instructed to tap the right button when the red light comes on or tap the left button when the green button comes on. He or she has to identify which light is on and then initiate the correct movement. A physical education lesson, in which the pupil has to follow instructions, is another example involving conscious processing of information before or during a movement. The information processing and the decision making requirements of a motor task may influence an individual's ability to perform the task or the speed with which the task is carried out. Some individuals may take more time to process information in the central nervous system and some may have more difficulty understanding task requirements or following instructions. The brain will give instructions to the muscles that compensate for the effects of lax ligaments or muscle tone, or arm or finger length, when carrying out a movement. The production and co-ordination of movement comes from the central nervous system. Movements are controlled by the brain and practice leads to the establishment of learned motor programs, which increase the speed, accuracy and smoothness of movements. The brain is focusing on the endpoint or goal of the activity and it controls the muscles to move the limbs to achieve that goal. The brain will give instructions to the muscles that compensate for the effects of lax ligaments or muscle tone, or arm or finger length, when carrying out a movement. We have described the factors which influence all movements and in this section we identify the way in which motor skills actually develop during infancy. There are many studies which have demonstrated that basic gross and fine motor skills usually develop in a specific order and the ages at which children sit, crawl, walk, jump, run, drink from a cup, use a knife to cut or a pen to write letters, manage buttons and zips have been documented. Specific gross and fine motor skills are assessed on many developmental tests, and motor skills also influence the scores of infants on some cognitive tests as they are expected to demonstrate their understanding by picking up or manipulating objects or toys. As all parents know, the age at which healthy, typically developing children reach milestones can vary widely with some walking as early as 10 months and some as late as 24 months. This variation is largely thought to be determined by genetic make-up, but it is also affected by the opportunity to move and explore. For example, one Chinese study demonstrated later walking in those children kept in beds or cots for longer periods than usual because of living circumstances. The early gross motor skills of sitting, standing and walking involve increasingly successful control of body posture and balance and these will be needed for maintaining body stability when bending to reach an object or later when writing and drawing, and when developing sporting skills. All children perform movements in a 'clumsy' or immature way at first and refine their performance with practice. This point has already been made, but it is worth emphasizing. All children perform movements in a 'clumsy' or immature way at first and refine their performance with practice, often over many months or years. For example, for typical children, posture control when walking continues to improve up to 7 or 8 years of age. 2. What do we know about the development of motor skills in children and adults with Down syndrome? Research into the development of motor skills in infants and children with Down syndrome is limited at the present time[1,2,3] and it can be divided into two main types - descriptive studies and experimental studies. The studies of infants and children are mainly descriptive and there have been a small number of experimental studies of children but most of the experimental work has examined the skills of teenagers and adults. Descriptive studies usually document the ages at which skills are attained. These may be basic gross and fine motor skills, and sometimes recreational skills as well as component skills such as balance, or eye-hand coordination. Experimental studies usually require participants to learn a new motor action or to carry out actions at speed. Unfortunately, the findings of many research studies in the area of motor skills have to be interpreted with caution for several reasons. Small numbers. Researchers have often studied very small numbers of children or adults. For example, one widely quoted study reports findings based on 2 children with Down syndrome in one age group and 4 in another. Given the considerable variability of progress among children with Down syndrome, it is impossible to judge how representative the performance of such small numbers of children actually is, and therefore whether the findings can be generalised. Comparison groups. Another weakness of many studies lies in the comparison groups that they use. Many studies of both adults and children compare their motor skills with typically developing individuals of the same chronological age, usually reporting significant differences in performance, with those with Down syndrome having 'poorer' skills. However, when the comparison group is matched on mental age, then there is often no significant difference in the overall motor performance of the groups. Any differences that are found tend to reflect strength and balance issues or speed and accuracy of performance, rather than overall motor control. Practical relevance. A number of studies are of theoretical rather than practical relevance. Currently many researchers are interested in the detailed way in which movements are carried out by individuals with Down syndrome and they measure differences in the angles of joint movements, take measures of the actual activation patterns of muscles, or study the differences in patterns of gait. Most of these studies indicate largely normal movement patterns. [10,14,15,22] Some do indicate difference in muscle activation patterns[9,13,15] however, since no one has conscious control over the sequence of actions of muscles when moving, these studies have little practical relevance. One of the important issues in the study of motor development in people with Down syndrome is whether there is delay in achieving milestones and/or whether movements are abnormal or not properly suited for their purpose. Some of the relevant research is considered in this section. Motor development for children with Down syndrome is usually significantly delayed. All the basic motor skills are achieved by infants and children with Down syndrome in the same order, but usually at significantly older ages when compared with typically developing infants and children. [5-8] This is illustrated by the examples given in Table 1. Table 1: Motor Milestones - Ages of attainment for children with Down syndrome. There is greater variability in the basic motor progress of children with Down syndrome, when compared with typically developing children. For example the average age for walking in typically developing children is 13 months and the range is 9-17 months, while the average age for walking in children with Down syndrome is 24 months and the range is 13-48 months. Many movements continue to seem somewhat 'clumsy' in individuals with Down syndrome. It takes them longer to improve their skills and they may not reach the same levels of fine coordination, but the levels they do achieve will usually be adequate for successful performance. A number of studies [2,10,11] indicate that balance is a particular difficulty and continues to be a weakness in teenage years. This may explain why many young people with Down syndrome find riding a bicycle difficult to master. Some children do become competent on two wheels but many do not achieve this, though they may be very competent on a tricycle. Strength also continues to be lower even when the comparison is with young people of similar general mental abilities. The explanation for this is not clear. Everyone increases their muscle strength through active movement and it could be that individuals with Down syndrome engage in less active movement, although there is no direct evidence of this. The babies, toddlers and children that we see regularly in our preschool and school services seem to us to be quite active. It could be that children with Down syndrome need more exercise to reach the same levels of strength. Some studies have also reported slower times (compared with mental age matched controls) for the movement component of tasks as well as the reaction time. [14,15] The movement time would be the time taken from initiating movement to reaching the end point of the movement - for example, the time taken from initiating the movement to completing the tap in the reaction time task. Data from experimental studies requiring fine motor tasks to be carried out [15,16] and from real life studies of activities such as running,  report significant improvement in the performance of tasks with practice - improvements in both speed and accuracy of movements. However, some of these studies concluded that individuals with Down syndrome require about twice as much practice to reach the same level as typically developing individuals of the same mental age. They seem to need more practice to establish motor programs. Some experimental studies have shown that adults with Down syndrome are more successful at learning new movements in response to visual cues than to verbal instructions. It has been suggested that this may reflect different brain organisation for movement control, but this hypothesis needs more research. The implication of this is that children and adults may learn new skills better by modelling or copying them than by being given verbal instructions. .
Why this profile of development? At the present time, we do not have enough knowledge about the reasons for these features of motor development but we do have several facts which may provide some clues and guidance for more effective intervention. Both the descriptive studies of children's progress and some experimental studies of motor skills in adults identify that the motor performance of individuals with Down syndrome is closely linked to their general cognitive progress. In other words, for gross motor, fine motor and experimental tasks, they perform like younger children with the same cognitive or mental age. This suggests delayed rather than different motor progress. For example, one American study charted the progress of 15 children with Down syndrome who were 7 to 10 years of age, and who had had the advantage of well-organized early intervention and education. The findings in Table 2 show the close relationship between their mental and motor progress. For the reader interested in the data, the correlations between the fine motor and gross motor skills and mental age are both .64 and statistically highly significant. A study of teenagers also showed the close link between motor skills and mental age. The reason for the close association of overall mental and motor development is not clear. It may reflect that the control of motor skills is largely a central nervous system activity and that brain functions play a central role in motor development in the same way as they do in cognitive development. It could be that both mental and motor development are delayed by similar differences in brain processes. One of these differences could be speed of information processing in the brain. Another could be the ability to establish learned programs in the brain. A number of studies have highlighted the inconsistent performance of children with Down syndrome on both cognitive and language tasks. It seems to take them longer (i.e. they need more practice) to effectively consolidate new learning. Researchers have reported that children and adults with Down syndrome rely more on visual feedback while carrying out a task than typically developing individuals. They may need to rely to a greater extent on visual feedback because they take much longer to establish learned motor programs for the task. This can make their performance seem as if they are tackling each repetition of the task as if they have not performed it before. It also means that their pattern of movement may be jerky and inconsistent from one time to the next even though they can actually perform the task correctly. This finding could explain longer movement times because, as a learned program is established, the sequence of movements needed can be performed more quickly. As already identified, there is some evidence that balance may be a particular difficulty for individuals with Down syndrome. In one experimental study, the balancing abilities of infants with Down syndrome were compared with typically developing infants and the two groups were carefully matched for their ability to stand unsupported. The infants were put into a small room in which the floor was stable but the walls could be moved to give the impression of the room tilting. All the infants reacted as if the floor was also tilting by leaning, swaying, staggering or falling, that is, they reacted as if to stop themselves from falling even though the floor did not move. The visual information suggested they were being tilted even though the vestibular information and d proprioceptive feedback would not have suggested this. The children with Down syndrome were more affected and made larger postural adjustments than the typically developing children. Both groups of children improved as they increased their experience of walking and after some 12 months of walking the typically developing children were finally able to stay stable in the tilting room and not react to the false visual cues. The children with Down syndrome needed longer to become stable and did not show complete stability after a year or more of walking experience, even though they were improving. The authors suggest that these findings indicate that children with Down syndrome are more dependent on visual cues to judge body position than typically developing children at the same stage of walking, possibly indicating that their vestibular system is not as efficient at this point. There is other evidence to suggest that balance continues to be an area of specific difficulty into the teenage years. In an Australian study of the motor skills of 81 teenagers, balance was the weakest area and still at a 4 year level when their other motor skills range from 5 to 9 year levels. Their mean mental age was 4 years 9 months and therefore most of the motor skills for the group were higher than might be expected, with response speed at the same level as mental age and only balance lower than mental age. There was considerable variability in motor skills between individuals and, as in other studies, mental and motor skills were related. Individuals with lower mental ages tended to have lower motor skill scores, and vice versa. . Many authors assume that the profile of motor development in Down syndrome is largely the result of physical differences, but the evidence for this point of view is limited. Almost every discussion of motor development in children with Down syndrome starts with descriptions of hypotonia and lax ligaments, and suggests that they are to blame for the motor delays. Many newborn children with Down syndrome have very flaccid muscles and are described as 'floppy'. There are many specific disorders which are associated with the birth of 'floppy' infants; in some cases this disappears as the child develops and in some cases they remain in this 'floppy' state. There are a few follow up studies of infants with Down syndrome and it seems that this infant floppiness does improve over time. However, there is a fairly widespread belief that the children remain with a degree of hypotonia and this state is often invoked as being responsible for much of the 'poor' motor function seen in people with Down syndrome. Clearly, a great deal of research needs to be done to clarify the different contributions of the stretchiness of ligaments and tendons, the strength of the muscles, the 'tone' of the muscles and the contribution of the nervous input to the greater picture of motor function. Some authors rightly draw attention to a number of conditions that are more common in individuals with Down syndrome and which may affect a child's or adult's ability to be active. [1,2] These include heart conditions, , underactive thyroid function, vision and hearing issues, and obesity. It will be important to take account of health factors for individual children and adults when considering active sports but most will not prevent progress in basic gross or fine motor skills. The relevance of each of these illness conditions for activity will be the same as it is in the rest of the population. The movement skills of children with Down syndrome are largely delayed rather than different. The movement skills of children with Down syndrome are largely delayed rather than different. They progress at the same pace as their general mental development. They may take longer and need more practice to improve their performance and they may continue to have more difficulty with tasks requiring balance. Most children achieve competence in all everyday gross and fine motor skills even though they develop more slowly. Despite the presence of lax ligaments and possible hypotonia, there is little evidence that they impair controlled movements as the central nervous system controls all movement and compensates for such variables. 3. What do we know about the effects of interventions? There are very few evaluations of therapy aimed at improving or accelerating the development of basic skills. Some early intervention programs which target all aspects of development indicate gains in motor development with milestones reached earlier. This may be because babies are encouraged to be more active and interested in their environment, and encouraged to play and to move. .
One evaluation of a common form of physiotherapy reported no significant gains in motor development for infants in therapy compared with infants not receiving therapy. Another recent study evaluated a very specific therapy to encourage walking by placing infants on a treadmill for up to 8 minutes a day from the time that they could sit without support. The treadmill infants walked on average 101 days earlier than a comparison group, presumably as a result of this increased practice. .
We found no evaluations of the adaptations and advice offered to improve gross or fine motor skills. However, many practical aids such as the appropriate size of chair and table, special grips for spoons, pens and pencils, and spring loaded scissors may be helpful in giving a child improved opportunities to practice. In addition, many practical programs provide ideas for activities which will encourage a child to practice. Activities designed to increase muscle strength of the whole body and of the hands, are likely to be beneficial, as are activities that will improve balance such as walking on a beam (at ground level), hopping, and playing football. This lack of research evidence does not, of course, mean that babies and children do not necessarily benefit from the recommendations given in books of practical advice - we do not know because the studies have not been done. However, the benefits are likely to be mainly the result of providing games and activities which encourage and increase active movement therefore increasing the child's amount of practice. Practice allows the central nervous system to develop more effective motor programs for smoother and more coordinated movement. We also found no data on the numbers of teenagers or adults who become competent in recreational skills or any studies documenting the effects of teaching such skills to a representative group. There are a number of articles and chapters encouraging educators to improve the opportunities for children, teenagers and adults to enjoy a wide range of sporting and recreational activities and identifying the social and health benefits. We would entirely agree with this advice, as it applies to everyone, but we would benefit from more information on successful programs and some actual measurement of the benefits. Some physiotherapists suggest that the main aim of therapy in infancy is to prevent abnormal postures and gait, which may be the result of lax ligaments, such as widely splayed hips when sitting, a wide based gait or turning feet out when walking. However, as we have already discussed, some of the most knowledgeable current researchers in the area argue that 'abnormalities' in the way movements are seen to be carried out may be necessary adaptations at particular stages, for example, to enable children to maintain their balance. [9,13] They argue that the movement seen may be the best adaptation the child or adult can make and that we should not be trying to push them towards 'normal' postures and styles of movement. One concern we have is that therapy may not always seem to take account of the child's developmental stage - the child with Down syndrome may be showing immature styles of movement that are seen in younger children when they begin to use the same movements. In addition, because children with Down syndrome progress more slowly they may use immature styles for longer and need more practice to improve and gain better control and coordination. One concern we have about supportive aids that restrict movement is that they prevent the child from being able to control the restricted joint and muscles. This prevents the practice of effective control of the movement and it will prevent gains in muscle strength. However, at the same time we do not know if any lasting harm comes from continuing to use 'abnormal' movements such as crab crawling with the knees out sideways to the body and hips rotated. It has been suggested that this may lead to long term damage of hip joints but no one actually knows if this is true as there are no long term follow up studies. The body is a dynamic and flexible system and possibly no harm comes from these actions in the long term. It seems that we have no real evidence that interventions other than encouraging and increasing the opportunities for active movement influence motor progress. Since the most important factor in improving movement is the control from the brain, it is important to find fun ways to encourage infants and children to initiate their own movements. This applies to babies and toddlers when learning all the basic skills such as rolling, reaching, grasping, sitting, standing, walking and feeding. Fun activities then need to be encouraged as often as possible to give the child practice. Some activities may need support such as walking. When babies bounce on parents' knees, they are strengthening their legs with the help of support before they can stand. Gaining balance and posture control for walking seems to take quite a while and practice in walking with a truck to push or supervised practice for short periods in a baby-walker may be beneficial. Baby bouncers will also strengthen the legs if used for brief, supervised sessions. We know that many professionals advise against these aids, but if they are used wisely they can increase the child's opportunity to practice walking, as the treadmill study did. All active movement will be improving balance and strength, but it is also possible to think of particular activities to target one or the other. Supervised trampolining will improve balance and strength, for example, as will skipping, hopping, jumping and kicking a ball. Hand gym exercises (e.g. squeezing ball of different textures) will improve hand strength. Research indicates that it is more effective to teach children with Down syndrome by modelling the activity than by giving verbal instructions. This suggests that children will learn more effectively by being able to imitate or copy correct actions. While many young people take time to develop writing and drawing skills, in our experience it is worth continuing to practice at all ages. Drawing, painting and coloring are described as a favourite activities by many teenagers and we know of many accomplished artists in different countries who show technical talent and considerable artistic expression in their art. Hand-writing often continues to improve into adult life. Enjoying active sports and dance will bring many benefits for health and social contact in addition to the pleasure, self-confidence and pride that may be gained from the activity. Success at sporting activities often seem linked with family interests and the opportunity to start early and engage in high levels of practice. We know individuals who are exceptionally good skiers or swimmers, for example, and in each case their family gave them the opportunity to start early. Karen Gaffney, a young woman with exceptional swimming ability and stamina, has swum in an English Channel relay and her achievements can be found on her website ( http://www.karengaffneyfoundation.com/ ). Dancing is an activity that is enjoyed by almost all the individuals with Down syndrome that we know and has the potential for enjoyment whatever level of skill a person has achieved. Almost everyone enjoys a disco, while some achieve considerable skill in ballet and many display great talent in emotional expression through dance and mime. It may be important to start activities such as swimming and gymnastics early. Many communities have opportunities for preschoolers to begin these activities as well as dancing. All the ordinary park games will also help, for example running, playing football, climbing and using swings. The advice to teach by demonstration is equally important for sporting and recreational activities. We have observed this in school physical education lessons and in dancing classes. 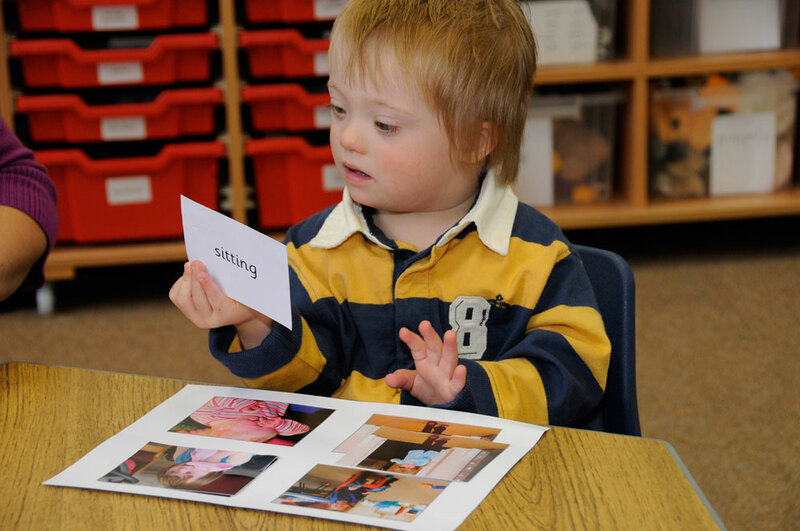 Children with Down syndrome do not seem to find it easy to listen to or follow the teacher's verbal instruction - rather, they watch the other children and copy them. In a dancing class, the teacher often does demonstrate the steps but in school physical education lessons, much of the instruction is verbal and this may be much less effective. Many communities have clubs for sport and recreation, and some teenagers and adults will enjoy inclusive facilities but some will prefer to join clubs for others with intellectual disability or the Special Olympics so that they have a chance to shine at the sport and to find close friendships. With more children with Down syndrome being educated in mainstream school, they will have the chance to join in a wider range of activities than may be available in many special schools. This will provide greater chances to find out what they enjoy and where their talents lie. One of us has a daughter with Down syndrome who walked very late (4 years) and had a 'poor gait', 'flat feet' and 'poor' posture throughout her childhood. We are not a sporty family and she led a rather sedentary life until she joined the Special Olympics team at the age of 21 and started training for running events. She then walked with a straight back rather than a slouch, lost her 'flat feet' and improved the 'normality' of her gait. (She also lost weight!) She also became quite a good runner and won some medals in Special Olympic events. She was very proud of these achievements. This suggests two points - it is never too late to improve the way basic skills may be performed and the best way to improve is through ordinary activity and exercise. It is also never too late to think of encouraging adults to become more active. Fine motor skills in children with Down syndrome: A guide for parents and professionals. By Maryanne Bruni (1998). Woodbine House. ISBN: 1-890627-03-8. Gross motor skills in children with Down syndrome: A guide for parents and professionals. By Patricia Winders (1997). Woodbine House. ISBN: 1-933149-81-6. Block, M.E. (1991). Motor development in children with Down syndrome: a review of the literature. Adapted Physical Quarterly, 8, 179-209. Reid, G. & Block, M.E. (1996). Motor development and physical education. In B. Stratford & P. Gunn (Eds.) New approaches to Down syndrome. Pp 309-340. London: Cassell. Weeks, D.J., Chua, R. & Elliott, D. (2000). (Eds.) Perceptual-motor behavior in Down syndrome. Champaign, IL: Human Kinetics. Shumway-Cook, A. & Woollacott, M. H. (1985). Dynamics of postural control in child with Down syndrome. Physical Therapy, 65 (9), 1315-1322. Sacks, B. and Buckley S. (2003). Motor development for individuals with Down syndrome - An overview. 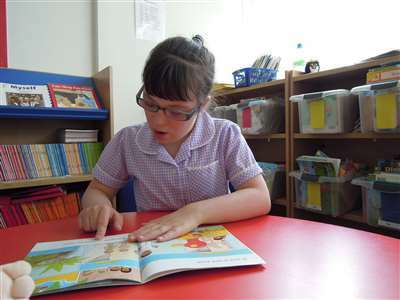 Portsmouth, UK: Down Syndrome Education International. Cunningham, C., & Sloper, P. (1978). Helping your handicapped baby. London: Souvenir Press. Berry, P., Andrews, R.J., & Gunn, V.P. (1980). The early development of Down's syndrome in infants. Final Report to National Health and Medical Research Council. St Lucia, Qld: University of Queensland, Fred and Eleanor Schonell Educational Research Center. Winders, P.C. (1997). Gross motor skills in children with Down syndrome. Bethesda, MA: Woodbine House. Latash, M.L. (2000). Motor coordination in Down syndrome: the role of adaptive changes. In D.J. Weeks, R. Chua & D. Elliott (Eds.) Perceptual-motor behavior in Down syndrome. Pp 199-224. Champaign, IL: Human Kinetics. Mauerberg-de Castro, E. & Angulo-Kinzler, R.M. (2000). Locomotor patterns of individuals with Down syndrome: effects of environmental and task constraints. In D.J. Weeks, R. Chua & D. Elliott (Eds.) Perceptual-motor behavior in Down syndrome. Pp 71-98. Champaign, IL: Human Kinetics. Butterworth, G. & Cicchetti, D. (1978). Visual calibration of posture in normal and motor retarded Down syndrome infants. Perception, 7, 513-525. Jobling, A. (1999). Attainment of motor proficiency in school aged children with Down syndrome. Adapted Physical Quarterly, 16, 344-361. Anson, J.G. & Mawston, G.A. (2000). Patterns of muscle activation in simple reaction-time tasks. In D.J. Weeks, R. Chua & D. Elliott (Eds.) Perceptual-motor behavior in Down syndrome. Pp3-24. Champaign, IL: Human Kinetics. Welsh, T.N. & Elliott, D. (2000). Preparation and control of goal-directed limb movements in persons with Down syndrome. In D.J. Weeks, R. Chua & D. Elliott (Eds.) Perceptual-motor behavior in Down syndrome. Pp 49-70. Champaign, IL: Human Kinetics. Almeida, G.L., Marconi, N.F., Tortoza, C. Ferreira, M.S., Gottlieb, G.L. & Corcos, D.M. (2000). Sensorimotor deficits in Down syndrome: implications for facilitating motor performance. In D.J. Weeks, R. Chua & D. Elliott (Eds.) Perceptual-motor behavior in Down syndrome. (Pp 151-174). Champaign, IL: Human Kinetics. Dulaney, C.L. & Tomporowski, P.D. (2000). Attention and cognitive-skill acquisition. In D.J. Weeks, R. Chua & D. Elliott (2000). (Eds.) Perceptual-motor behavior in Down syndrome. Pp 175-198. Champaign, IL: Human Kinetics. Peran, S., Gil, J.L., Ruiz, F. & Fernandez-Pastor, V. (1997). Development of physical response after athletics training in adolescents with Down syndrome. Scandinavian Journal of Medicine and Science in Sports, 7, 283-288. Connolly, B.H., Morgan, S. & Russell, F.F. (1984). Evaluation of children with Down syndrome who participated in an early intervention program: second follow up study. Physical Therapy, 64 (10), 1515-1519. Harris, S.R. (1981). Effects of neurodevelopmental therapy on motor performance of infants with Down's syndrome. Developmental Medicine and Child Neurology, 23, 477-483. Ulrich, D.A., Ulrich, B.D., Angulo-Kinzler, R.M. & Yun, J. (2001). Treadmill training of infants with Down syndrome: evidence-based developmental outcomes. Paediatrics, 108 (5), e84. Winders, P.C. (2001). The goal and opportunity of physical therapy for children with Down syndrome. Down Syndrome Quarterly, 6 (2), 1-4. Charlton, J.L., Ihsen, E. & Lavelle, B.M. (2000). Control of manual skills in children with Down syndrome. In D.J. Weeks, R. Chua & D. Elliott (Eds.) Perceptual-motor behavior in Down syndrome. Pp 25-48. Champaign, IL: Human Kinetics. Heath, M., Elliott, D., Weeks, D.J. & Chua, R. (2000). A functional systems approach to movement pathology in persons with Down syndrome. In D.J. Weeks, R. Chua & D. Elliott (Eds.) Perceptual-motor behavior in Down syndrome. Pp 305-320. Champaign, IL: Human Kinetics. Campos, J.J., Anderson, D.I. et al. (2000). Travel broadens the mind. Infancy, (2), 149-219.